Discover Parrot Jumping Race Drone, one of our second-generation Minidrones. Fast, energetic and ultra-stable, this dashing drone sports large tires for racing. Adapted for high speed, Jumping Race Drone offers pilots a spectrum of thrilling experiences. Jump into the heart of the race with a FPV headset for an adrenaline boost that will leave you feeling totally exhilarated. The Jumping Race Drone is made to race both indoors and outdoors. It runs twice as fast as its companions and can go as fast as 8 miles per hour. 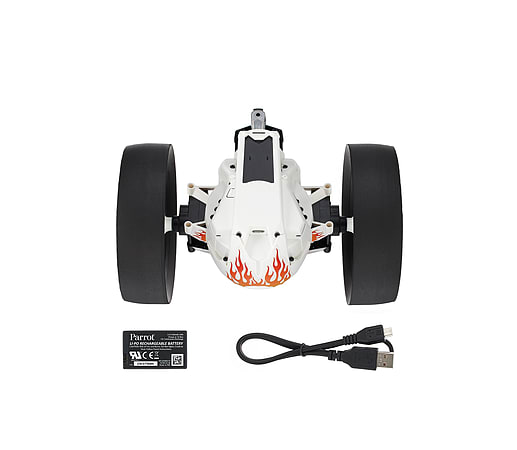 With Jumping Race Drone, test the road-handling and manoeuvrability of a robot designed for speed. Drive it on a smooth track to experience the thrill of speed! You can also record videos directly onto the internal memory. Jumper Mode: Jumps up to 75 cm/2.4 feet in height and length, and always lands on its wheels. As soon asyou pick-up the Drone, the lights will turn red notifying you that the jump is disabled. Kicker Mode: The springs enable Jumping Race Drone to push objects in its path. Auto-Balance Mode: Jumping Race Drone is perfectly balanced on the two wheels. Perform all of these acrobatic tricks through the Free-Flight 3 app. Retracted Wheel Mode: The wheels are retracted or in compact mode to enhance agility and maneuverability through narrow areas. The Jumping Race Drone embedded technology ensures perfectly straight driving paths and precise turns! Parrot Jumping Race Drone is equipped with a wideanglecamera lens that live streams video on the piloting screen. Discover the world from a new angle and explore inaccessible areas. king on the dance floor. Once you have programmed a sequence, it appears amongst the pre-defined tricks of your Minidrone. The FreeFlight 3 App is available on the Apple Store and Google Play Store. The app offers intuitive control from your smartphone or tablet and connects to your Parrot Jumping Night Drone through Wi-Fi®. FreeFlight 3 is used to control all Parrot Minidrones. A speaker produces sound animations depending on your Minidrone’s mood.